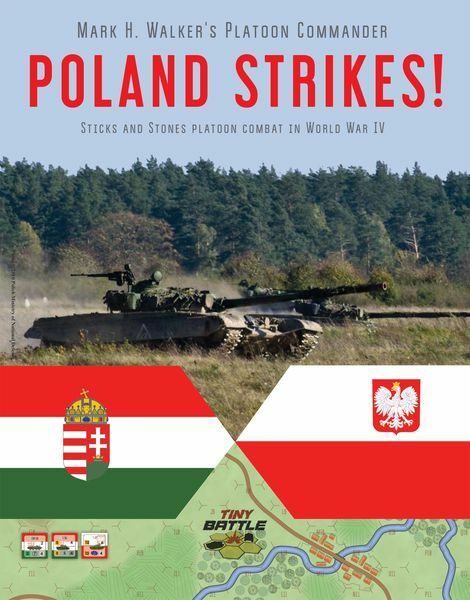 Poland Strikes is a Mark H. Walker-designed platoon-level, card-assisted World War Three-ish game based on Tiny Battle's Platoon Commander system. While the USSR is distracted by the West, Poland decides to settle the score with Hungary after years of escalating tensions along the border. Platoon Commander: Poland Strikes comes with three scenarios, 18 Action Cards, 88 counters and a 17" x 11" playing map gorgeously illustrated by Ilya Kudryashov, representing the Poland-Hungary border. The scenarios range from Polish Motor Rifle units, led by BMPs, OT-64, Infantry and Sagger teams, assaulting border crossings to massive armor battles pitting dozens of Polish T-72s against aging Hungarian T-55s and T-34/85s and even a handful of T-72s. It's a cold-war-goes-hot tactical combat blast from our Madonna-rich past. If you like tanks, dice, and fun, you'll love Poland Strikes. The game includes the latest version of the Platoon Commander rules (V1.5), streamlining, clarifying, and upgrading the already player-friendly system, and the latest enhanced art. Each turn is gamed through several phases. First off the players determine initiative with a unique dice-off system in which ties award the initiative to whomever lacked it the previous turn and applying the Commander's Focus to the roll might tilt the odds in your favor. Next, players will draw a scenario-designated number (usually just one) of Action Cards that may be used for anything from artillery strikes, through rally assists, to negating the opponent's just-played card. Then it is time to rally disrupted units with a simple 1d6 roll against a nationality or scenario-designated morale. Action Cards, in addition to the special Aid chit, may be used to improve a unit's chances of preparing for combat. It's the Fire Phase and players alternate firing with individual units or stacks of units against in-range and in-sight enemy units. When firing on the enemy tanks, the target's Armor Factor is subtracted from the firing unit's Armor Piercing Factor, two dice are rolled, and the results checked on the appropriate column on the Fire Results Table, yielding a number of potential hits. The target rolls a die for each potential hit and compares it to his or her morale. Pass the morale check, that hit is negated. Of course all these columns and die rolls can be modified by the target's terrain, flanking fire, the Focus marker (represents the commander's presence), and most importantly Action Cards, which can call for supporting fire (artillery, airstrike), grant column shifts or even allow the same unit to fire again, adding a delicious uncertainty that makes the game thrilling to play. Players continue to alternate attacks until neither wishes to attack. Next comes the Movement Phase. Unlike the preceding Fire Phase, one player moves ALL his eligible units before the opposition gets to move. Certain units can move and fire or vice versa (with a penalty), unfired opposing units can opportunity fire on enemies moving within their line of sight. As in many other facets of the game, the insightful play of Action Cards during the movement phase is critical, allowing additional movement or opportunity fire conducted by units that have already fired. No PanzerBush tactics here, you never know when a unit will be able to fire on you. Exciting stuff. Finally we reach the Aid and Focus Phase. Platoon Commander eschews the use of HQs that can be unrealistically targeted. Instead both players have Aid and Focus markers, representing where the commander intends to place emphasis or send additional assets (ammunition, weapons, etc) or first aid. The placement of these markers provides combat and morale bonuses to the units underneath them. Additionally, if the player chooses, the Focus marker can be used to influence the initiative roll. And that's a turn of Platoon Commander.